Mini roller set - 1 roller, 2 fleece, 2 sponge roller covers & 1 tray. 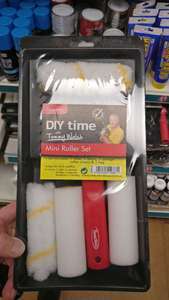 These are rubbish, especially the gloss rollers. The sponge comes away from the plastic insert. Leaving a sloppy sponge. Literally within minutes. Save your money, the tray is OK tho.